Join the most active social video sharing community. Keek is a fun new way to meet people, stay up to date with friends and show the world what you’re up to in realtime. Capture, watch upload short video updates with your smartphone, tablet or laptop. It’s simple to use, extremely fast and 100 free. 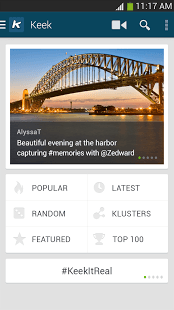 Instantly share video updates on Keek,Facebook, Twitter, Tumblr #4##and SMS.